End your summer with Riot Fest!!!! 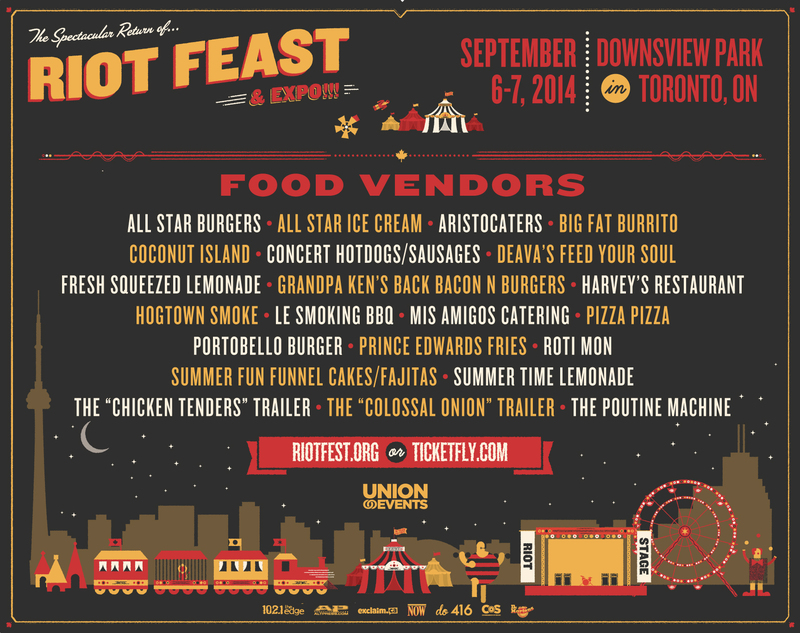 To cap off a fantastic summer filled with music festivals galore all around Toronto, Riot Fest is happening this weekend (September 6th and 7th) up at Downsview Park. The one downside is it is out of the way for people to go up there, compared to last year’s venue, Fort York, which has held the majority of awesome festivals this summer. However, the lineup will definitely make you want to trek up there. It is definitely more of a rock out day with Canadian bands like Death From Above 1979, Billy Talent, AWOLNATION, and Mounties playing alongside heavy-weights such as headliners The Cure, Rise Against and The Flaming Lips, who will put on a not-to-be-missed show for their most recent album The Terror. Other notable acts for Saturday I’m looking forward to seeing are Brand New, Taking Back Sunday, The Afghan Whigs, Manchester Orchestra and Bad Suns. This is the day that there is a band or two for everyone, from moshers, to shoe-gazing swayers, to rockers. Day headliners City and Colour, The National, and Death Cab For Cutie will supply the gentle sway songs to calm down to, after the crazy sets expected by Metric, Stars, Dropkick Murphys, Die Antwoord and local bands Tokyo Police Club and PUP. For the punks, there is Social Distortion, Buzzcockz and Clutch. Other acts worth checking out is avant-punk band Nostalghia, local rockers Say Yes, and indie sweethearts The New Pornographers. As with any Riot Fest, there will be food and merch vendors throughout the park, and don’t forget the ferris wheel!! !